Our proprietary process and continual improvements to our ICF system led to our development of FlexxBoard25 – a rigid foam insulation board that provides improved performance over XPS (Extruded Polystyrene) boards – at a lower cost. 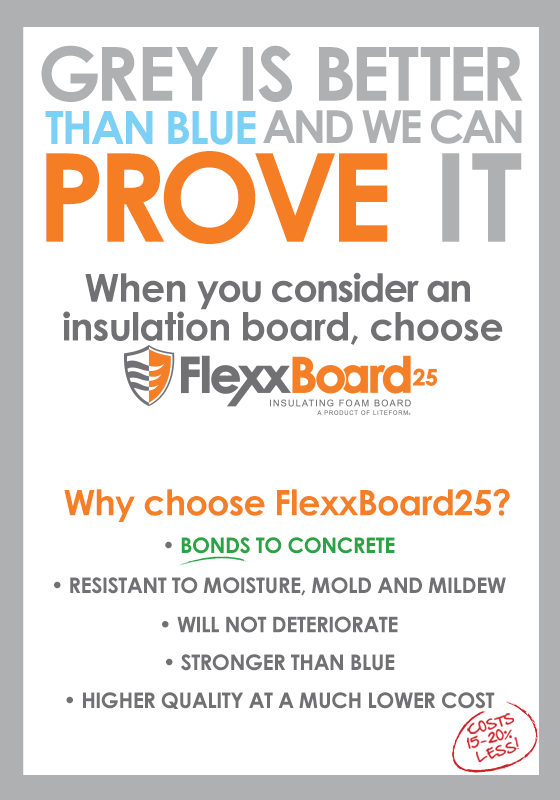 Even better, when used under concrete, FlexxBoard25 bonds to concrete forming a superior thermal barrier, helping to prevent shifting, heaving and cracking. Under-Slab Thermal Barrier – When used as a thermal barrier before pouring concrete, FlexxBoard25 bonds to concrete – reducing heat loss and helping to prevent possible frost heaving. 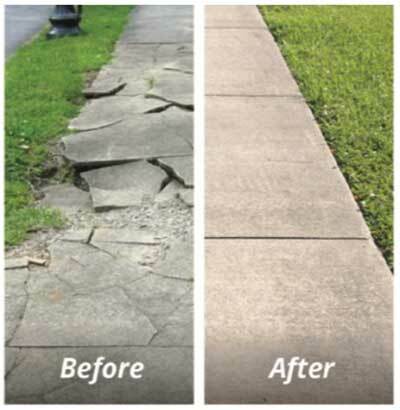 It helps extend the life of concrete driveways, sidewalks, patios, basements, shop and garage slabs, and basements. In-floor Heating – FlexxBoard25 can be used as a thermal barrier beneath concrete slabs when installing radiant floor heating systems – preventing heat loss to the ground while promoting even heating. Perimeter Insulation – When used around the perimeter of a poured concrete or block wall foundation, FlexxBoard25 prevents heat loss. In shallow foundation designs, using FlexxBoard25 around the perimeter of a poured concrete slab will help prevent frost penetration and frost heaves. Custom Fill Applications – FlexxBoard25 is simple to use in structural fill applications – custom shapes can be fabricated by LiteForm or be delivered in blocks and fabricated on site. Roof Applications – FlexxBoard25 is an exceptional insulator and fill material for all roofing applications. FlexxBoard25 can be found at most building supply centers. Competing colored foam boards (Extruded Polystyrene) because of it’s smooth finish is known to seperate from concrete. This will ultimately diminish r-value and result in the need to replace the concrete in the future.